Hintergrund: Graduated in Data Processing, post-graduated in System Analysis, she worked with website development für 15 years. In 2016, she was awarded a Chevening Scholarship (a UK government’s international award scheme) to do her Masters in Economics for Transition at Schumacher College. Debora is a social designer, economist for transition and passionate about dialogue. In the last six years has been an activist and working for programs of social development organised by D-Lab at MIT. 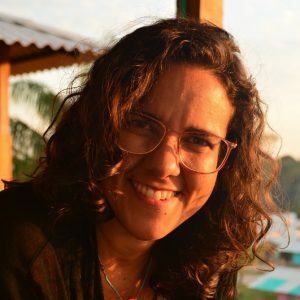 Trough this partnership, she is part of the steering committee of International Development Innovation Network (IDIN), with which she has organised summits in the USA, Uganda, Tanzania, India, Colombia and Brazil. She is interested in how communities experience and deal with economic and technological pressures. She uses a holistic approach to understand and support digital and human connectivity use in areas of post-conflict and social instability. Debora collaborates with communities in the Brazilian and Colombian Amazon region.